As-Salamu 'Alaykum, brother Osama Abdallah. I was wondering if you can tell me where the "Heart of the earth" is. For example, in this article: http://www.missionislam.com/comprel/jesuscrucified.htm it says the "Heart of the earth"
on your website, it says the "Heart of the earth" is Sychar in Samaria. So I just wanted to know which one it is, because I could see why it could be Mecca. And I could see why it could be Sychar in Samaria. I just wanted to know your thoughts on where the "Heart of the earth" might be, Jazak'Allah Khair P.S. I'm also palestinian. Sorry for not being able to reply back earlier. The heart of the earth akhi is the cave (like any bear's or moutain lion's cave) that Jesus Christ was placed in after the alleged crucifixion. In fact, the New Testament say it was a roomy cave, and it belong to a rich man. Christ was placed there in the cave, and above ground (he was never burried), and received medical treatment and massaging by Mary Magdalene and others, according to the New Testament's accounts themselves. This is also where Jesus became a Messiah according to Christians. He got annointed (rubbed with oil as this is the Jewish tradition of choosing a king) while in the cave, and from there he became the Messiah (King of the Jews). Jesus Christ never died. He was always alive and remained alive even after the alleged crucifixion. No resurrection happened. The Bible's use of "Rose from the Dead" is a symbolic term that means he didn't die, and that he defeated death by remaining alive. The Old Testament has also a RISING FROM THE DEAD incident also between Abraham and Isaac, peace be upon them. Yet, Isaac was never crucified nor died when he "ROSE FROM THE DEAD". For ample more details, quotes and proofs, visit: www.answering-christianity.com/convert_christians.htm. When the Bible says heart of the earth, it does not mean a cave. Mathew 12:40 is the verse we refer to. 40 For just as Jonah was three days and three nights in the belly of the great fish, so will the Son of Man be three days and three nights in the heart of the earth. The heart of the earth is synonymous to deep parts of the earth or the nether regions. This shows that Jesus descended into the lower parts of the earth to preach the good news to the people who died under the law so that he was able to take those who were waiting for redemption to Heaven with Him. The author of 'Matthew' is unknown. Secondly, any 5 year old can do the Math and work out that from Friday night to sunday morning is not 3 days/3 nights! The miracle of Jonah was that he was alive for 3 days and 3 nights! If Jonah was alive for three days and three nights, then Jesus also ought to have been alive in the tomb as he himself had foretold! But Christianity hangs on the flimsy thread of the death" of Jesus for its salvation. So it has to answer that Jesus was DEAD for three days and three nights. The contradiction between his utterance and its fulfilment is obvious. Jonah ALIVE, Jesus DEAD! Very UNLIKE Jonah! Jesus had said "LIKE Jonah" not UNLIKE Jonah. If this is true then according to his own test Jesus is not the TRUE Messiah of the Jews. If the Gospel record is genuine then how can we blame the Jews for rejecting "CHRIST". THREE AND THREE = 72 HOURS? The Doctor of Divinity and the Professor of Theology replies that in Matthew 12:40 under discussion, the emphasis is on the TIME factor - "as Jonas was THREE days and THREE nights in the belly of the whale, so shall the son of man be THREE days and THREE nights in the heart of the earth." "Please note," says the learned theologian, "that the word "THREE" is repeated F-O-U-R times in this verse to prove that Jesus was going to fulfil the prophecy as regards the length of time he was going to remain in the tomb, and NOT 'As Jonas was' in relation to his being alive or dead. If it is the time factor that Jesus was stressing then let us ask whether he fulfilled that aspect of his promise to the Jews as well. The Christian dogmatist answers: "OF COURSE!" The question arises: when was Christ crucified? The whole Christian world answers: "FRIDAY!" Is this the reason we celebrate "Good Friday" - as a Public Holiday in every Christian nation from America to Zambia, from Abyssinia to Zaire at Easter? What makes Good Friday" so good? "it is the death of Christ on the Cross on this day to wash off our sins," says the Christians. So he was killed on the cross on a Friday, 19xx years ago? "YES!" says the Christians. From the Gospel records we gather that the Jews were in a hurry to eliminate Jesus. Hence the midnight trial, and then dispatching him off to Pilate in the morning; from Pilate to Herod and then back again to Pilate. The vested interests were afraid of the general public. Jesus was their hero. He had been their benefactor. His enemies had to do away with him quickly, and succeeded in doing so. However, as much as they were in a hurry to hang him on the cross, they were in equal hurry to bring him down from the cross before sunset on Friday because of the Sabbath. The Sabbath starts at about 6 p.m. on Friday and the Jews were warned in Deuteronomy 21:23 that the victim of crucifixion was an "accursed of God" and was not to be permitted to remain hanging on the Sabbath day, "that thy land be not defiled which the Lord thy God giveth thee for an inheritance." To satisfy the religious scruples of the Scribes and Pharisees the "secret disciples" of Jesus took down the body from the cross. They gave the body the Jewish burial-bath, plastered it with "one hundred pounds weight of aaloes and myrrh" (John 19:39), then placed the shrouded body into the sepulcher before night-fall. There are numerous differences between the various sects and denominations of Christianity, but on the above they are unanimous. Jesus is SUPPOSED to be in the tomb on the night of Friday. He is still SUPPOSED to be in the tomb on the day of Saturday. He is still SUPPOSED to be in the tomb on the night of Saturday. Christians agree whole-heartedly with this. It will be noted that I have repeated the word 'SUPPOSED' three times. The reason is that the Gospels are silent as to when exactly Jesus came out of the tomb. He could have been taken away on Friday night by his "secret disciples" to a more congenial and restful place, but I have no right to assume about what the Gospel writers are silent. I have, therefore, repeated the word 'SUPPOSED' three times. You will no doubt note that the GRAND TOTAL is ONE day and TWO nights, and NOT three days and three nights. According to the Christian Scriptures Jesus had failed a SECOND time. FIRST he was unlike Jonah, who was ALIVE in the belly of the fish, which is the exact opposite of what the Christians claim had happened to their master Jesus, who was DEAD for the same period of time as Jonah was - ALIVE. SECONDLY, we discover that he also failed to fulfill the TIME FACTOR as well. The greatest mathematician in Christendom will fail to obtain the desired result - THREE days and THREE nights. 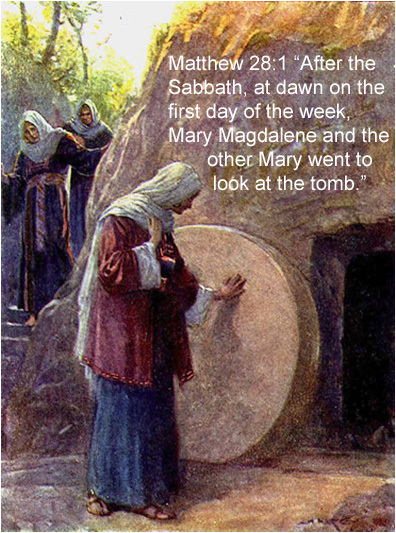 We must not forget that the Gospels are explicit in telling us that it was "before sunrise" on Sunday morning (the FIRST day of the week), that Mary Magdalene went to the tomb of Jesus and found it empty. If you go to Wikipedia you will find they cite 5 (non-Christian) references which supposedly prove that 'Isa was crucified. Someone should refute the claim. 45 And when he learned from the centurion that he was dead, he granted the corpse to Joseph. 46 And Joseph[a] bought a linen shroud, and taking him down, wrapped him in the linen shroud and laid him in a tomb that had been cut out of the rock. And he rolled a stone against the entrance of the tomb. After the 3 days, the body was no longer found in the tomb as the Lord Jesus's ressurrection had occured. Mathew Chapter 27: 63-66 describes how the soldiers placed a Roman Seal on the tomb which in those times meant that anyone breaking it would suffer an unpleasant death. 63 and said, â€œSir, we remember how that impostor said, while he was still alive, â€˜After three days I will rise.â€™ 64 Therefore order the tomb to be made secure until the third day, lest his disciples go and steal him away and tell the people, â€˜He has risen from the dead,â€™ and the last fraud will be worse than the first.â€ 65 Pilate said to them, â€œYou have a guard[a] of soldiers. Go, make it as secure as you can.â€ 66 So they went and made the tomb secure by sealing the stone and setting a guard. The following passage described what happened when 3 women that followed Jesus went to the tomb. 2 And behold, there was a great earthquake, for an angel of the Lord descended from heaven and came and rolled back the stone and sat on it. 3 His appearance was like lightning, and his clothing white as snow. 4 And for fear of him the guards trembled and became like dead men. 5 But the angel said to the women, â€œDo not be afraid, for I know that you seek Jesus who was crucified. 6 He is not here, for he has risen, as he said. Come, see the place where he[a] lay. Please feel free to reply if you would like anything to be explained or answered further. In the meantime, I pray to Almighty God that you may all grow in the grace and knowledge of our Lord and Saviour Jesus Christ. God bless you. When talking about the death of Jesus, the Bible is talking about the death of the flesh. The spirit can never die - even our spirits live after the body is dead. Prophet Jesus Christ, peace be upon him, never died even according to the New Testament itself. He received medicine and massaging from Mary Magdalene and others during this time. 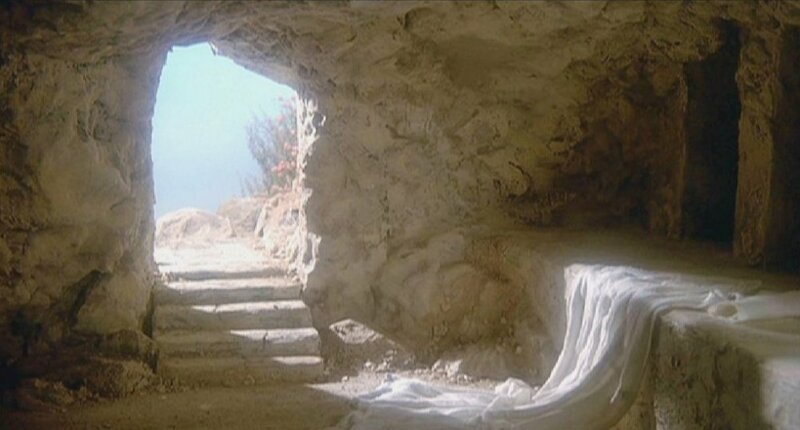 He then "rose up from the dead" and left the tomb (cave). 1- Notice in Luke 24:1, the women came to the tomb with medicine and found Jesus gone. If he was already dead, they would have no reason to bring this to dead Jesus. But Jesus was alive and was receiving medical treatment. 2- Also, notice in John 20:15, Mary Magdalene thought Jesus was a gardener, after he healed and rose back up. 3- And in John 20:17, Jesus was still in pain, he told Mary Magdalene "touch me not!". 4- And in John 20:19-29, Jesus showed his original body to the disciples, and they checked it. (1)- Never actually died. 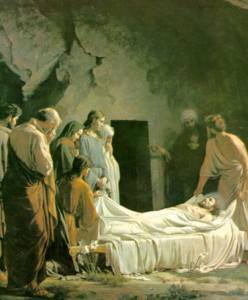 He has always been alive in the tomb receiving medical treatment. (2)- He was never buried underground, or in a coffin. He was laid on the floor, alive. And to really give a detailed answer, I would recommend first watching Dr. Zakir Naik's 3-hour debate (see link above) and respond to the many New Testament verses that he put forth that proved that Christ never died. Firstly I shall address medicine administered to Jesus that you speak of. 24 But on the first day of the week, at early dawn, they went to the tomb, taking the spices they had prepared. 3 Mary therefore took a pound[a] of expensive ointment made from pure nard, and anointed the feet of Jesus and wiped his feet with her hair. The house was filled with the fragrance of the perfume. 4 But Judas Iscariot, one of his disciples (he who was about to betray him), said, 5 â€œWhy was this ointment not sold for three hundred denarii and given to the poor?â€ 6 He said this, not because he cared about the poor, but because he was a thief, and having charge of the moneybag he used to help himself to what was put into it. 7 Jesus said, â€œLeave her alone, so that she may keep it[c] for the day of my burial. His body was buried in the tomb as it says in the Bible. As you read the full verse, you can see that the explanation you suggested is entirely different to what the Bible says. I urge you in the name of Lord Jesus to not misrepresent the word of God. You may not believe in it but, dear brother, if only you could see how it does amazing works amongst those who trust in His name. Hebrews 4:12 - For the word of God is living and active, sharper than any two-edged sword, piercing to the division of soul and of spirit, of joints and of marrow, and discerning the thoughts and intentions of the heart. God bless you all, may the grace of Lord Jesus be with you. Sorry, I accidently replaced this post with the one below. The original one for this one got lost. But it's ok. My answer below is thorough, insha'Allah (if Allah Almighty is Willing). The oinment worth 300 denarii was not wasted. The passage I referred to in my previous post was from John 12:1-7. This shows that when Jesus was in the house of Lazarus when Mary anointed Lord Jesus's feet with the ointment - verse 3 Mary therefore took a pound[a] of expensive ointment made from pure nard, and anointed the feet of Jesus and wiped his feet with her hair. The house was filled with the fragrance of the perfume. If you look at Mathew 26:6-12, Jesus is again in Bethany but this time he is at the house of Simon the leper. The woman came to him with "an alabaster jar of very expensive perfume, which she poured on his head as he was reclining at the table". Lord Jesus says in verse 12, "In pouring this ointment on my body, she has done it to prepare me for burial." None of his words are in vain. 52 Then Jesus said to him, â€œPut your sword back into its place. For all who take the sword will perish by the sword. 53 Do you think that I cannot appeal to my Father, and he will at once send me more than twelve legions of angels? Secondly, Lord Jesus would basically be lying if he had faked his own death. And since he had said that he came to do the will of the Father, you are suggesting that God lied to all the people who were at the crucifixion. There are two points to consider here. What purpose would this have achieved? If it was God's will that Jesus shouldn't die, then surely it would have been better to save him publicly so that sinners may repent, listen to Jesus and turn to the Father. Most importantly, God is righteous and truthful. In a world that was at the time already full of darkness, idolatory and lies, would God really give people another lie to believe in? Furthermore, if they truly wanted to annoint him to be the Messiah in the tomb (cave), then they would've also brought men with them. Three women sounds very suspicious, if not ridiculous, to annoint THE LORD MESSIAH, the King of the Jews and King of entire earth when he returns. You see, this is where the New Testament shows its corruption and fabrications. What does a wiping of Jesus to make him the Messiah, in front of people and the disciples, have to do with burial? And who told you that "burial" here means actual death? The Bible is so filled with metaphores that you really can't take it literally. The Bible in so many verses uses terms such as GOD, DEATH, LIFE loosely. 52 Then Jesus said to him, Put your sword back into its place. For all who take the sword will perish by the sword. 53 Do you think that I cannot appeal to my Father, and he will at once send me more than twelve legions of angels? 1 The LORD said to Samuel, "How long will you mourn for Saul, since I have rejected him as king over Israel? Fill your horn with oil and be on your way; I am sending you to Jesse of Bethlehem. I have chosen one of his sons to be king." 3 Invite Jesse to the sacrifice, and I will show you what to do. You are to anoint for me the one I indicate." 4 Samuel did what the LORD said. When he arrived at Bethlehem, the elders of the town trembled when they met him. They asked, "Do you come in peace?" 5 Samuel replied, "Yes, in peace; I have come to sacrifice to the LORD. Consecrate yourselves and come to the sacrifice with me." Then he consecrated Jesse and his sons and invited them to the sacrifice. 6 When they arrived, Samuel saw Eliab and thought, "Surely the LORD's anointed stands here before the LORD." 7 But the LORD said to Samuel, "Do not consider his appearance or his height, for I have rejected him. The LORD does not look at the things man looks at. Man looks at the outward appearance, but the LORD looks at the heart." 8 Then Jesse called Abinadab and had him pass in front of Samuel. But Samuel said, "The LORD has not chosen this one either." 9 Jesse then had Shammah pass by, but Samuel said, "Nor has the LORD chosen this one." 10 Jesse had seven of his sons pass before Samuel, but Samuel said to him, "The LORD has not chosen these." 11 So he asked Jesse, "Are these all the sons you have?" "There is still the youngest," Jesse answered, "but he is tending the sheep." Samuel said, "Send for him; we will not sit down until he arrives." 12 So he sent and had him brought in. He was ruddy, with a fine appearance and handsome features. Then the LORD said, "Rise and anoint him; he is the one." 13 So Samuel took the horn of oil and anointed him in the presence of his brothers, and from that day on the Spirit of the LORD came upon David in power. Samuel then went to Ramah. 23 "So now the LORD has put a lying spirit in the mouths of all these prophets of yours. The LORD has decreed disaster for you." So why couldn't Jesus Christ fake his death on the cross? And even if he never faked it, he could've easily passed out from all of the fatigueness and tiredness that his body had to endure. But he most certainly never died. My dear brother, you are the one who is considering it a lie, when the Bible clearly permits it. As to your question: "What purpose would this have achieved? If it was God's will that Jesus shouldn't die, then surely it would have been better to save him publicly so that sinners may repent, listen to Jesus and turn to the Father." In Islam, we don't believe the Lord Jesus Christ (Al-Sayyed Al-Maseeh in Arabic) died, nor got crucified. My discussion with you, dear brother, is based on what the New Testament currently says. And even with what the New Testament says, we can clearly see that Christ never died. But the Islamic point of view is Jesus was saved. 17 One day Jesus was teaching, and Pharisees and teachers of the law were sitting there. They had come from every village of Galilee and from Judea and Jerusalem. And the power of the Lord was with Jesus to heal the sick. 18 Some men came carrying a paralyzed man on a mat and tried to take him into the house to lay him before Jesus. 22 Jesus knew what they were thinking and asked, â€œWhy are you thinking these things in your hearts? Jesus' authority was ONLY earthly. It was limited to this planet earth, and nothing more! And this is nothing new in the Bible, by the way. Others in the Old Testament were able to do these things, and also raise the dead. So Jesus being the bread of life, and having the authority to forgive sins, and what have you is nothing but metaphores, and privileges that were given to him by his Creator, Allah Almighty. Otherwise, Jesus is absolutely a nothing and a nobody when compared to GOD Almighty. In fact, add all creations with Jesus and still we all add up to absolute nothing when compared to GOD Almighty. Notice the "our God". GOD Almighty is Jesus' GOD and Creator. It's really simple, dear brother. It's very simple. It's the Trinitarians who are the lost and complicated ones. ""Why do you call me good?" Jesus answered. "No one is goodâ€“except God alone." (From the NIV Bible, Mark 10:18)"
Even when Christ performed Miracles, he always took permission from GOD Almighty, and seeking GOD Almighty to give him the power to perform the Miracle. He couldn't do a thing by himself. I hope this helps, insha'Allah (if Allah Almighty is Willing). Take care, and may Allah Almighty further opens your heart, shed His Light upon you, and lead you more and more to Islam. Ameen.